This is a killer dish to either eat by it self for a light meal or as a side dish. If you are asked to bring something to a family meal, take this dish. Your bowl will be clean when you take it home. 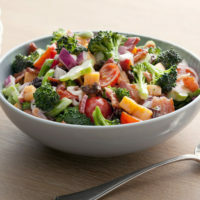 This Broccoli Salad recipe is an adaptation of a Paula Deen recipe which originally had a cup of mayo instead of the yogurt. Her recipe had over 440 calories per serving. This one has only 250. It is also high in vitamin A and has over 126 % of your daily allowance of vitamin C.
Cut the washed broccoli flowerets into bite size pieces. 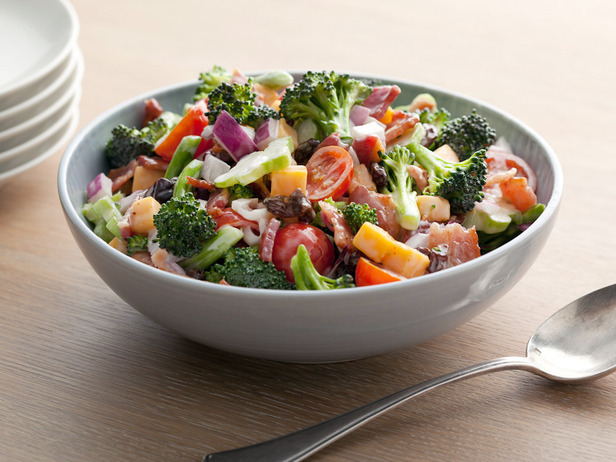 Add the veggies to a bowl along with raisins, cranberries, sunflower seeds and crumbled bacon. Mix yogurt, vinegar (put vinegar in 1 T at a time and check flavor), sugar, salt & pepper in separate bowl, mixing well. Pour over veggies and toss. Hey There. I found your blog the usage of msn. This is an extremely well written article. I will make sure to bookmark it and return to learn more of your helpful information. Thank you for the post. I will definitely return. Thanks a bunch for sharing this with all folks you actually realize what you’re talking about! Bookmarked. Kindly additionally seek advice from my web site =). We will have a link change agreement among us!